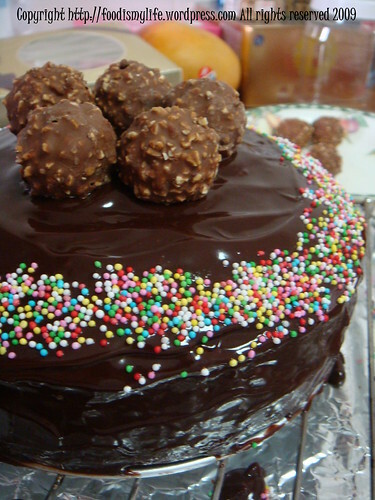 When a friend’s birthday is coming, it gives me a reason to browse through all the cookbooks and recipes that I have on hand to select a birthday cake recipe; it gives me a reason to ogle and drool over all the lovely pictures of chocolate cakes posted on websites; and the best of all: it gives me a reason to bake. Well, not that I need a reason to bake, but having someone to bake for delights me. It just makes me want to go the extra mile to make the cake extra delicious, extra pretty, and extra perfect. This cake was baked almost a month back, for two of my friends’ birthday. Their birthdays fall just two days apart from each other, and it’s a “tradition” for us to celebrate their birthday together. Last year, I baked a Tiramisu Cake, and I’ve gotten rave reviews about it. This year, due to their birthday falling on the examination period, I choose to bake something simpler, less fussy, yet delicious at the same time. With no time to try out baking the cake, I choose a recipe from the recipe book that I’ve always trusted – one of the 500 series. This time, it’s form 500 Cakes by Susannah Blake. The cover of the book states “the only cake compendium you’ll ever need”, and well, I don’t wholly agree with it, because, I can never have enough of cake recipes; but, it is definitely the book that I will go to if I ever need to bake a cake that I need it urgently – because the recipes never go wrong. The recipe is called a Dark Chocolate-Mocha Mud Cake. Hmmm, doesn’t mocha already encompass both chocolate and coffee? So I’m just gonna rename it a Mocha Cake. And since it’s a birthday cake, shall call it a Mocha Birthday Cake. I guess I just like to change the names of the cakes. Ooops. 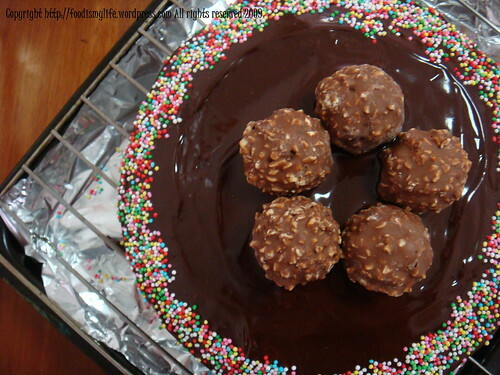 This cake is made using a good amount of dark chocolate. Mine contained almost 70% of coca. One bite of this cake really gives off the “oomph” of the chocolate. It is that rich. I’m a lover of dark chocolate, so this cake is really one of my favourites. Do you know that dark chocolate it’s good for health? It’s rich in antioxidants, relaxes blood pressure, lowers cholesterol, contains healthy fat, makes people happy and blah blah blah. So I guess this is another good reason to bake, isn’t it? 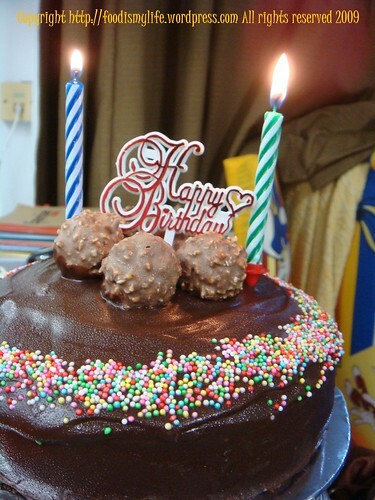 The cake is baked in a 7-inch round cake tin instead of an 8-inch one. I scooped a small ladle of the batter into a ramekin and baked it alongside with the 7-inch cake just so that I can have a taste of the cake. The cake therefore is higher, and I think that it is possible to split the cake in half and sandwich with some vanilla buttercream. Yum. The only disappointment that I have from this cake is that the chocolate flavour is so strong that it overpowers the coffee taste. It tastes more like a chocolate cake than a mocha cake. None of my friends can tell that there’s a hint of coffee in it, and neither can I. I think this may be due to the inferior quality of the instant coffee that I use. Perhaps if I have used instant espresso or a more intensely-flavoured coffee, the coffee flavour will be brought out more. Put the chocolate, butter, sugar, milk and coffee together in a large pan. Heat very gently, stirring, until the butter and chocolate have melted, the sugar have dissolved and everything is incorporated and smooth. Remove from the heat and leave it aside to cool for 15 minutes. The mixture will still be a little bit warm. keep posting!!! I love it!!! !